Last week I had the great pleasure of attending a session on values conducted by John Armstrong which was incredibly thought provoking . I particularly enjoyed the conversation on how we find a balance between running a values based organisation and running a business, so we ensure we are sustainable and cost effective with our practices. John also used a phrase which stayed with me, “sometimes we have to see to believe but sometimes we have to believe to see”. I reflected on this phrase a lot and what it might mean for Inclusion WA and whether we can ‘see or believe’ the continual improvements we need to make. Thankfully by an act of serendipity we had our annual 2 day staff retreat (Praxis) last week, so we were able to spend many hours discussing, debating and challenging ourselves on where we are and where we need to be. There were many different opinions on our strengths and weaknesses but on the whole, the entire organisation all shared the same vision, and committed to work towards it. I think the very fact we can, as a whole staff, get together and have these conversations helps keep us on the right path. Anyway, enough of my philosophical musings, on other matters I’m delighted Jess Kain, our Youth Connect Coordinator, has had her brilliant work recognised by an invitation to speak at the National Youth Disability Conference. I am incredibly proud of Youth Connect and the positive changes it is making in the lives of teenagers with a disability. Please head to our website for stories from the Youth Connect program. We are thrilled to announce that Jessica Kain, the Youth Connect Program Coordinator has been invited to speak at this year’s National Youth Disability Conference. We want to highlight sporting and recreation clubs in WA that are working hard to be inclusive. Our first spotlight shines on West Rise, WA’s first ever inclusive basketball competition. Following the success of the Inclusive Holiday Program in Karratha, Inclusion WA is now heading to Carnarvon! If you are interested in participating in a conversation about the program, please head along to the Community Consultation this September. Are you interested in attending an ActiveSmart session? These sessions are FREE and there are refreshments provided! The aim of these sessions is to give sport and recreation providers, as well as local councils and other interested members of the community, an understanding of mental illness and the effects of stigma. We want to break down the myths surrounding mental health, so that we can increase sport and recreation opportunities for individuals with a lived experience of mental illness. Travis is a young man in his early 20s who has learning difficulties due to some mild intellectual disabilities. Travis was referred to us just over twelve months ago, and from our very first meeting he expressed his desire to get some training and a professional qualification, so that he could find a paid job. To start, we helped Travis to update his Centrelink membership as well as find a new employment support organisation. From there, we supported Travis to participate in group training sessions and job searches in conjunction with Intework (employment support organisation based in Osborne Park) which eventually led to job interviews and some work placements. However, after a number of different employment opportunities Travis had not found the right match. He told us that he "just wants to be a grown up man, employed, like other men in his age." And then, a couple of weeks ago, something great happened. 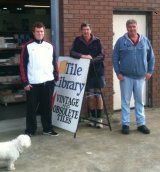 We were fortunate to came across an opportunity for Travis to work at a tile shop in Osborne Park. It is a small, family business run by two brothers who were looking for a third member for their team. After an interview with Travis they decided that he would be the perfect man for the job. A few weeks on and they all seem very happy and satisfied with each others company and the brothers have found Travis to be a great worker. I am really happy for Travis and believe they will build a very solid long term relationship out of this opportunity. Little Athletics 4 All - There are still four more dates in September to come and try athletics. For kids of all abilities aged 6 - 16 years. Paddle @ The Lake - A fun kayaking activity for people of all abilities - taught by level one flatwater instructor Guy Power and Brock Ingram, Australian para canoeist. Keep up to date with Inclusion WA's quarterly Sports Newsletter - find out about Inclusive Opportunities in WA!